One Barely Used RefreshaBraille 18 Cell Refreshable Braille Display For $1,275.00 USD!!! 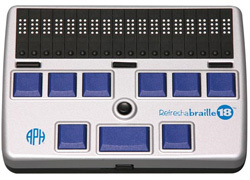 This week we are pleased to offer you One Barely Used RefreshaBraille 18 Cell Refreshable Braille Display with both wireless and Bluetooth Connectivity for only $1,275.00 USD! This unit has been used for less than two hours and is as close to brand new as a unit can get! It's the perfect 18 Cell companion for portable, wireless Braille users who need to connect to a PC or Macintosh from time to time. It's the only Braille display on the market today that allows you to turn the display 180 degrees and invert the keyboard and position of the display for comfort while being able to effortlessly enter Braille! The RefreshaBraille connects with a variety of Windows, iOS, and Android Screenreaders, touting both versatility and compatibility in a sleek, yet rugged design. With free shipping within the Continental United States, this is an over 25% savings on a portable display with plenty of cells to get the job done! This unit will be sold on a first come, first serve basis. To be the first to secure this unit please use the Buy Now link included below. For more information, or to order this product offline, email featured@flying-blind.com or call +1 (216) 381-8107 today. 11F) Here's a VipAdvisor Interview with Ilkka Pirttimaa, Developer of BlindSquare: How it started; What's new in 2.0; plus future plans!